I am seeking for the position of Finance Manager/ Financial Analyst/ Controller/ Senior Accountant/ Internal Auditor. I believe my extensive knowledge and skills make me an excellent candidate for the position. I am ACCA Qualified (Chartered accountant), CPA (exempt on the basis of ACCA) and CA Finalist having 9 years of experience in the relevant field with 4 years’ experience of working as a Finance Manager/Analyst. In my last position with Ultimate Human Resource Solutions, where I worked in the capacity of Financial Manager, I was responsible for leading a team of 8 and carrying out a wide range of financial processes. During the course of my career, I have gained a specialist’s understanding of financial instruments and accounting software and have also been effective in explaining complex information in a comprehensible manner. If you feel that I can be the right person for the post then do call me at _____________. This job will certainly allow me to indulge in cultural explorations and passion. Thanks for your time and considering this letter. I am writing to express my interest in joining your company for the vacant related position. I am confident that I will be an addition to your already professional team and be able to further my career in a reputable and well-established organization such as your company. I sincerely hope that you will find my attached Resume' meets the position requirements. Please feel free to contact me at any time asking for an interview to expose and discuss my credentials and strengths. I am ready to apply my business and Engineering mentality in any industrial or service sector. It is with great interest that I am forwarding my CV for your consideration. Application for possible vacant position that would fit to my qualification. My record of academic achievements and professional career history, demonstrates attributes that make me a valuable employee. My work experienced has equipped with enough skills and knowledge to whatever duties that may be assign to me if given the chance to be employed in your company. I look forward of speaking with you soon. As a highly skilled professional, I believe my experience aligns well with the qualifications you are seeking for your company, and I certain I can make a valuable addition to your organization. Through my work experience I have been trained for the possessing a strong commitment to achieve long-term goals of the organization, I realize the need to work in a profound manner especially planning and directing the day-to-day operations of the company. Furthermore, I have a proven ability to build up innovative strategies to improve customer service, and maximize profitability. I have a proven track record of ensuring customer requirements are met, complaints are resolved effectively, and service is provided in a speedy and efficient manner. I am a hands-on leader who develops a good rapport with my staff and a working environment. I am always ready to think “out the box” to make sure my company is a step ahead of the competitors. The position of a manager professional at your company will provide me with a chance to contribute to your success as a leader. I am looking forward to meet you to further discussion of my application for this exciting position. This letter is to introduce myself and to let you know of my interest in becoming a part of your company. The enclosed resume will furnish you with information concerning my overall employment background, training, education and skills. My work abilities are backed up with experience and knowledge. I assure you that I can successfully fulfil any obligations requiring of any responsibilities upon your company. In each of previous job experience, I have performed my assignments with a high degree of skill and professionalism. My current objective is to obtain a position that will fully utilize my skills and offer an opportunity for continued professional growth. I believe in excellence and have always dedicated myself, my talents and my creative abilities to assure the successful accomplishment of any company goals. My positive attitude and willingness to give 100% makes me a valuable asset to any organization that would employ me. I am confident that my skills will be an asset and have a favorable impact in your organization. I look forward to hearing you in the near future and hopefully to schedule an interview in which I hope to learn more about your company. Its goal and plans and how I may be contribute to its continued success and growth. Thank you for your time. Well presented with exceptional customer service skills, and the ability to provide an effective Admin, Coordination & Customer Service. Experienced in working under pressure in a quick paced fast moving environment and able to receive guests on arrival in a friendly, helpful and approachable manner. Able to be an integral member of an administrative and clerical team, and can follow instructions and also have a willingness to learn. Objective is to work in an exciting and professional environment of the organization with personal development and growth possibilities and to achieve company’s goal through professional ethics, sincere commitment and hard work. Enclosed is my CV that includes the above achievements and outlines several others that will be of interest to you. I would appreciate the opportunity to discuss your requirements further, and to establish my skills as a match for them. Please feel free to call me at my mobile number or email me I look forward to our meeting. I am interested in exploring the possibility of seeking employment with your organization, please find my resume enclosed with the details relevant to my experience, skills and education, References or any other information you require shall be promptly upon your request. As my resume indicates, I have established a sound educational history encompassing a variety of diverse environments. I possess excellent interpersonal skills accompanied with the ability to relate effectively to multitude of individuals on all levels of intellect. My work ethic founded on a “what-ever-it-take” attitude and diligent persistence to ensure all projects are completely fulfilled to the utmost ability. I would now like to contribute and utilize my skills in your organization, Realizing that it is not always easy to evaluate a person from a summary statement, I would appreciate the chance to discuss employment with you in an interview. Thank you for this initial consideration, I look forward to meeting you soon. I have over 8 years of experience in Public Relations / Events / Marketing / Advertising and Fashion. I possess strong work ethics and I am ambitious. I was hired as a Talent Manager at a prominent company. I have excellent writing skills and the ability to find innovative solutions and ideas. I am a quick learner. I am a people person. I love working in a team and on my own. I thrive in a competitive environment. I am highly flexible & I can adapt to demands of a highly competitive and demanding industry. Objective is to obtain a challenging position in a reputed organization, an organization that recognizes dedication, devotion and achievements with the ample of opportunities of advancement in my skills and experience. Please accept this as my job application and supporting material for the post in your prestigious organization. I am confident that my academic qualifications and past job experience have prepared me well for the challenges this position offers. A brief review of my CV will highlight the strong match between my qualifications and your position. I would appreciate the opportunity to discuss my background, education, and past working experience with you, I am available at your convenience to discuss my candidacy in greater detail. Thank you for your consideration. Please find the attached CV below. As a highly skilled & competent individual with 6 years of work experience as part of a team as well as a team leader I am writing to express my strong interest in working for your Company. I believe my experience & qualification will certainly make me a valuable addition. - Strong organizational and analytical skills. - Ability to produce consistently accurate results. - Work under pressure while maintaining quality of work. - Ability to multi task and manage conflicting demands. In addition to my experience & personal qualities I have a solid education foundation with an eye for perfection. I am extremely enthusiastic about working for your company and would welcome the opportunity to contribute to your business growth. I am enclosing my curriculum Vitae with details of my career and qualifications to date in hope that you may find it suitable for applied position. Having worked in a sophisticated environment of well reputed organizations, I have developed my ability to respond to strict deadlines and challenges. Through interaction with staff from diverse backgrounds. I have enhanced my interpersonal, coordination, communication and time management skills as well. I am an enthusiastic and a dedicated professional, who enjoys being part of a successful and productive team. Able to work well on my own initiative and can demonstrate the highest level of motivation. I am reliable, trustworthy and confident persuasive team builder who remains level headed under pressure. As you can see, I have had extensive vacation work experience in office environments in service industries, giving me varied skills and the ability to work with many different types of people. I believe I could fit easily into your team. I am a conscientious person who works hard and pays attention to detail. I'm flexible, quick to pick up new skills and eager to learn from others. I also have lots of ideas and enthusiasm. I'm keen to work for a company with a great reputation and high profile. I’m contacting you regarding your job openings. My interest in this position stems from my belief that I have the right combination of relevant staffing experience, communication skills, and high level of organization that make me a good candidate. I consider myself to be a dedicated and dependable individual holding Bachelor of Commerce and Post-Graduation Diploma in Human Resource Management, excellent in verbal and written communication skills with one year work experience in Automobile Company as Administrative Assistant and Customer service. I feel that a relationship with your company would be mutually beneficial. In closing, I would like to thank you for your time and attention and I hope to have an opportunity to discuss the opening with you in person. I would like to take this opportunity to submit my CV for your review and kind consideration, as I have been given to understand that there exist a vacancy for sales in your esteemed Organization. Based on my professional experience I am confident that I would be the right candidate for the position available in your Company. I have always taken the extra effort to consistently exceed the expectation of my duties and responsibilities assigned. I would greatly appreciate your team to hear my view point on the suitability to this position through an interview process. I would be more than happy to provide additional documents, references if and when required. Thank you for considering my application herein. I wish to offer my application for the position of an ____________. In pursuit of further career prospect and to widen the horizon of my experience, I am exploring possibilities of a challenging assignment in your organization. I have developed communication skills with commitment and loyalty, can work under pressure and consider myself to be honest, self-motivated, numerated, and quite adaptable with the ability to learn quickly. I assure you that given a chance I shall rise up to the expectation of all. Please find attached copy of my CV, contents of which will give you a comprehensive overview of my qualification and experience. If you consider my application suitable, I would be most happy at your earliest time to discuss the vacancy. Thank you so much and I look forward to hear from you soon. I am submitting my resume for the above post for your kind perusal. My education as well as vast work experience has prepared me for a professional business environment. I adapt easily to organizational conditions and remain committed to excellence. I am result oriented and possess leadership qualities and effective inter-personal skills. Besides, as a person I have established a reputation for being highly trustworthy, motivated and efficient. I conduct myself in a manner consistent with management and its policies regarding work ethics. I consider sincerity in work and honesty in all dealings as essential criteria for success. Hard work and strong ethical values are the foundations on which my approach is built on. Team work and group communications, I feel, one an integral part of a good work force and I strive my best to work together, while remaining independent in completion of set tasks. I am currently seeking new job prospects in an appropriate position, compatible with my qualifications and experience, and would welcome the opportunity to further discuss how I am best suited to meet the needs of your esteemed organization. I am currently looking for a job that would extensively make use of my competencies and capabilities. I have been employed to one of the fast growing companies in India. 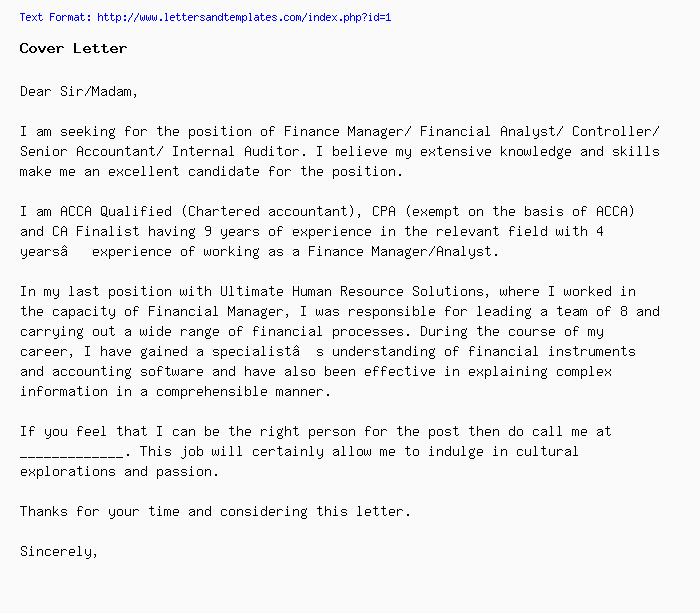 I would like to apply for a suitable position in your company because I know I am capable of being an asset to you. I communicate well both in oral and written English and I am confident to say that I am a people person. Although the business, organizations and companies in Dubai are very different from what I have been used to in India, given the ample time and information, I am positive that I can easily learn. I am very good oriented and I make specific and timed goals whether set by the company or the management or by me. Regardless of who set them, I put all effort in making sure that these goals are met within the specific time frame set (so long as the goals are realistic). I can easily adapt and work in different environments. With my qualifications, I believe, I am well-suited to work in your company. Attached herewith is my CV for your assessment and kind perusal. You can reach me through my mobile, which is written in my CV. Focusing the issue at hand is my specialty. A professional, fast paced, structures and team oriented environment is the setting I thrive in. If you are looking for someone who is flexible, professional, creative, and a great team member in your organization, I am confident that I fit your requirement. If you are seeking a supervisor/manager who stays abreast of his field, who understands the challenges, who earns 100% staff support, and who is as career-committed as it takes to achieve total success, then please consider what I have to offer. I would be happy to have a preliminary discussion with you or members of your committee to see if we can establish a mutual interest. I have attached my resume for your kind perusal. If you agree that my qualifications are a close fit to your needs, I would be delighted to meet with you for a personal interview. In the meantime, you may reach me at __________. I look forward to our conversation. I will call you within the week to answer any initial questions you may have.